My dog trainer is competing at Crufts this year (she does most but I didnt know her last year lol!) 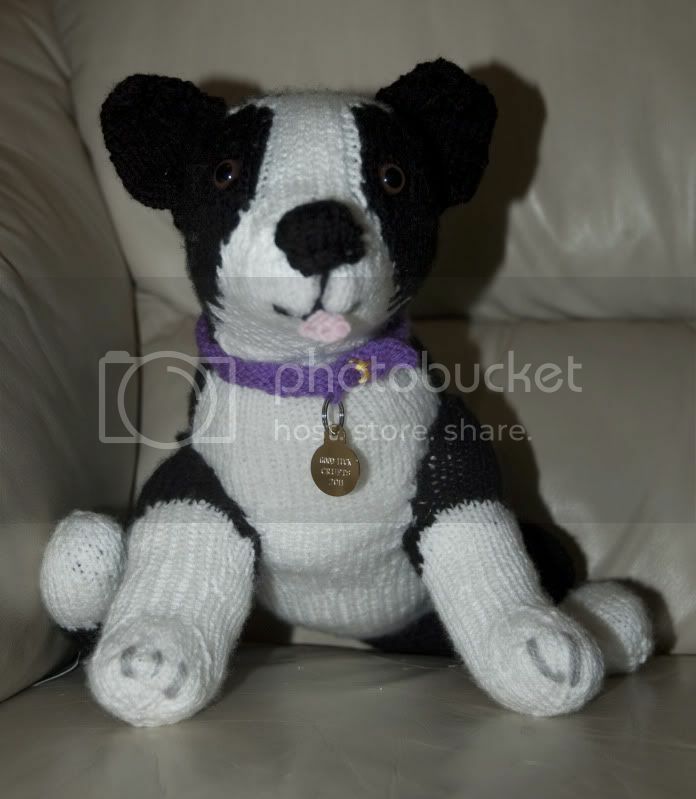 in competitive obedience with one of her Collie's so I decided to knit her a Border Collie as a 'good luck' gift. Anyway - after that massive essay (sorry!) I finally got him finished today - so here he is! 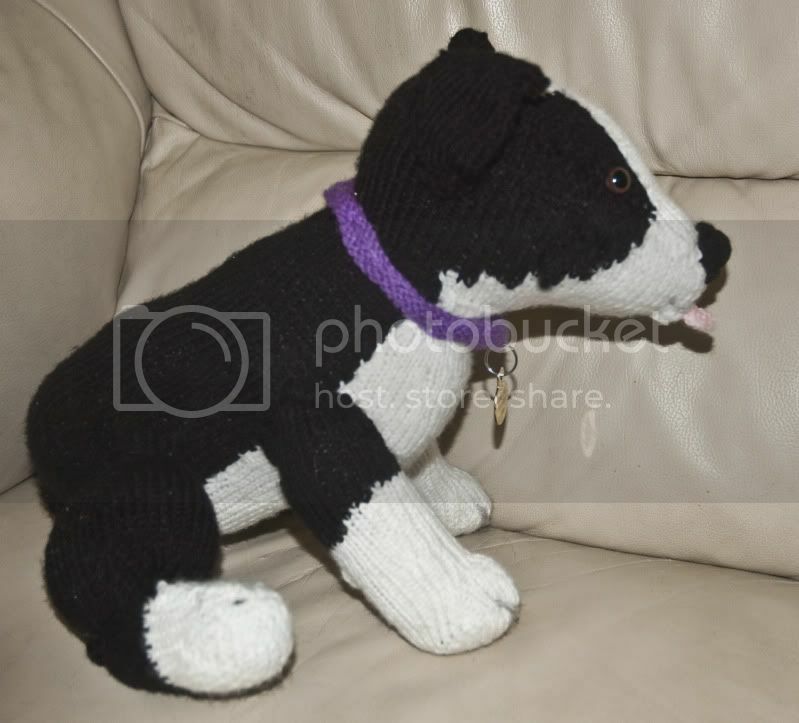 I'm giving him to her tomorrow - and am shitting myself as am really shy, not good at giving people things I've made for him - and aren't as pleased with him as I could be - but everyone I've asked says give it so I will do! You did a great job!! so adorable! where did you get the pattern from? 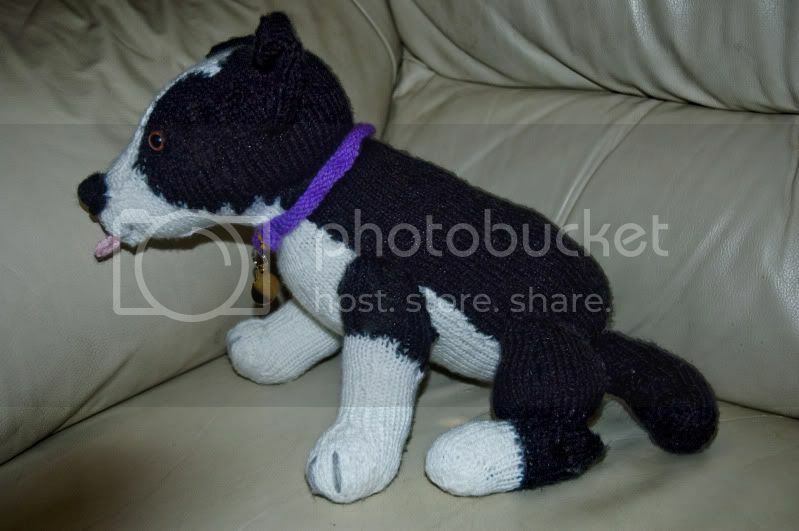 http://kestrelfindsandmakes.blogspot.com/ and LadyMissP on Ravelry.....Check me out! I think he's adorable! I've just started one of Alan Darts dog patterns (the dalmation, but doing it my own dog's colours) so I'm pleased to have seen 2 patterns on here recently that have come out so well...it gives me hope that mine won't look too much like a gremlin. Was he well received by your trainer? We've had a BC for almost 15 yrs. My 18 yr old has been taking lots of pictures of her and spending as much time as she can because she says she's preparing herself for 'that time'. It is hard for all of the kids to imagine life without her because most of them can't remember not having her tagging along. But it seems to be hardest for her. I am getting this pattern. Her birthday is coming up and I think this would be something she would treasure. You did a fantastic job! he's a little cutie. I don't know anyone who wouldn't be proud to recieve as wonderful a gift as him. I bet he's full of good luck to! Easter Potty Humor... I Guess That's a Thing?